You’ll have to visit a store this month for a serial code. Bet Team Magma and Aqua wish they knew about that! The two titans of Hoenn that mess with the weather are coming to generation seven games! 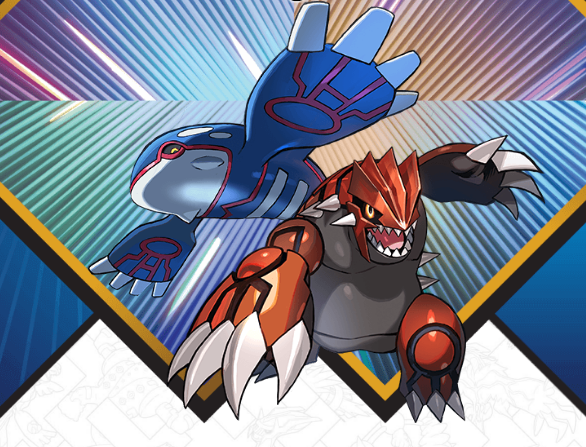 American players of Pokémon Sun, Pokémon Moon, Pokémon Ultra Sun, or Pokémon Ultra Moon can download the corresponding Legendary (Kyogre for Sun and Ultra Sun, and Groudon for Moon and Ultra Moon – yes, that’s around the right way!) via serial code. You’ll have to visit your local Gamestop to get the code between August 3–26. Other countries have the same method this time around, albeit with different stores and sometimes slightly different dates. Canada and Australia have Gamestop counterparts EB Games doing the distribution for instance, while Germany, Ireland and Italy use Gamestop until the 25th. The UK and Spain have GAME, Belgium and the Netherlands Game Mania, and France Micromania. As usual, players using the ‘Ultra’ versions of the game get a level 100 version of the Pokémon and a bonus Gold Bottle Cap, compared to Level 60 and no item for Sun and Moon. Which Legendary of the two do you prefer? Remember that with both of them in Ultra Sun and Moon, you’ll be able to catch a Rayquaza in-game as well! Thanks to Taro for the tip.